These are so cute! 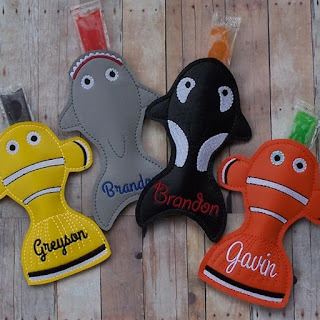 Personalized Popsicle Holders $3.99 (Retail $8.00). This deal is for your choice of ONE personalized popsicle holder! Keep the little ones from arguing about whose popsicle belongs to who! Each holder is made of marine grade vinyl with machine embroidered accents and personalization! These holders are fun and easy to clean - wipe with warm soapy water and let air dry! The approx. size of each holder is listed on the photo! The popsicle holders will all hold a standard-sized popsicle or anything that is similar in size! I've included a photo of a standard size popsicle and the smaller version - hopefully, this helps to give a good visual size comparison! Because each holder is hand cut, slight variations will occur! $2.99 for the first item and free for each additional item. US only. Ships no later than Thu, Jun 14.